Crumbling bank image via shutterstock. Reproduced at Resilience.org with permission. So the bankers continue to pump, jawbone, and panic at every slight downturn in financial market prices because that’s all they have left in the world upon which they can hang their reputations. So when the crisis came, which was rooted in too much debt, there were no sane voices in the central banks or halls of government power saying, hey you know what? That wasn’t such a good idea. Perhaps we should pay off our past debts and then take on new credit at a pace no faster than our growth in income. Whether it’s now, or in ten years, or in a hundred, sooner or later the economy of ‘stuff’ cannot grow any more simply because there won’t be enough land, ore bodies, or energy to do do so. Given the macroeconomic data as we have it, there’s nothing that would rationally or logically support the prices we see for equities and bonds we currently see. But to grow even more from here, even if that’s just 4% annually across the globe implies that we’ll find a way to fully double the entire world’s consumption of resources in just the next 18 years. That’s the nature of compounding…even 4% growth means a 100% increase in just 18 years. 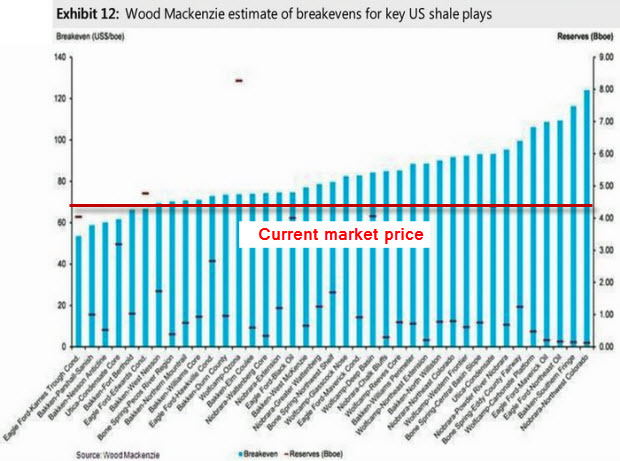 As we can see in that chart, the only plays that are still viable at today’s prices are the core areas of the Bakken and Eagleford plays, which should not surprise anybody. Those were the ones drilled first and hardest because they are the most economic. (Reuters) – Plunging oil prices sparked a drop of almost 40 percent in new well permits issued across the United States in November, in a sudden pause in the growth of the U.S. shale oil and gas boom that started around 2007. New permits, which indicate what drilling rigs will be doing 60-90 days in the future, showed steep declines for the first time this year across the top three U.S. onshore fields: the Permian Basin and Eagle Ford in Texas and North Dakota’s Bakken shale. I have to ask – 40% – is that a lot? Yes, it sure is. And in just one month. Notice that the decline in permits was even quite pronounced in the core shale plays revealing that even within the Bakken and Eagleford there are operators who don’t believe it makes economic sense to drill at these oil prices. The shakeout that is coming to that industry is going to be quite pronounced and we’re expecting some serious fireworks as investors wake up to the fact that sometimes defaults really do happen and losses are a part of this game….something the central bank liquidity injections have managed to mask and forestall for quite some time now. The bottom line, though, is that without growth in oil economic growth is hard to achieve. I’ll go further and say it’s impossible to achieve, at least under the old paradigm of consumption based growth. Unfortunately nobody – and I mean nobody – in the any central bank is even remotely talking about or in any way displaying that they are even dimly aware of the role of energy in economic growth. To them it is all about the banks.